Understand Markets in 5 Simple Videos. We’ll explain you Stocks Markets overall in < 1hr. based on your risk-tolerance & long term goals. Investing in the Markets with SIPs may not be productive, as you get only HALF of the market gains in bull runs, & lose on the entire corpus during crashes. We will alert you to entry & exit points, as needed. This is not frequent trading, and can be done easily, say, once a quarter / half-yearly, or, on sudden panics. Exotic-ETFs – By the time markets multiply 2x in 5 – 7 years, Exotic-ETFs can multiply 8x (as designed). See our Blog page for details. EXCLUSIVELY available on www.L2M.co.in. I/We are NOT a registered broker, NOR a registered Financial Advisor, and the consultation provided is for educational & informational purposes only. I/We have 5+ years of stock market investing experience (2014 onwards), both US & INDIA markets, and our performance & current portfolio is listed on the website. As part of this PDS (Portfolio Design Service), you will manage & maintain your trading / brokerage account. We will design your portfolio for the long run, provide you knowledge of the smart products, and guide you along the way, via regular monitoring, portfolio allocation alerts, & monthly updates. Prices include GST (as applicable). All sales FINAL / NO REFUNDS. A comprehensive knowledge of the stock markets (once & for all) in 5 simple videos. For DIY investors, Mutual Fund/SIP investors, or seeking knowledge to invest with confidence. 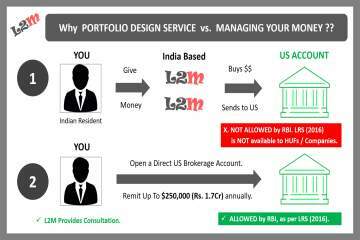 Invest in the US markets from India, with a direct US brokerage account (Exotic ETFs & $/Rs benefits). Learn about stock markets in 5 simple videos, from an IIT & Stanford alum, having 5+ years of experience in stock markets. Learn peace-of-mind or buy-&-forget investing, and not too much frequent trading (which can be like a casino & un-productive). Then, learn India-2-US investing, offering triple benefits to the Indian residents, as in superior returns, smart products like Leveraged-ETFs, & $/Rs gains, etc.